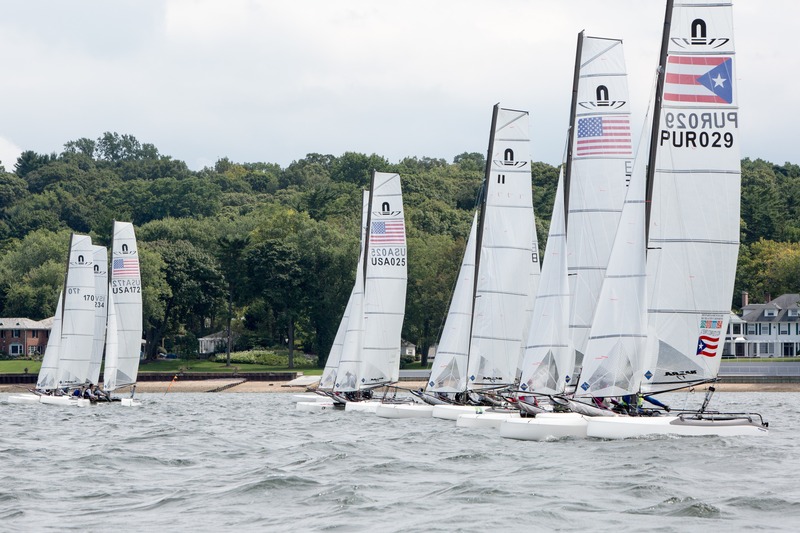 OYSTER BAY, NY (09.22.2014) – With shifty and breezy conditions, day one of the 2014 49er, 49er FX, and Nacra 17 U.S. National Championship provided exhilarating racing for competitors. The rare Easterly wind direction provided sailors with robust puffs off the land and consistent 10-12 knots breeze. Needless to say, the catamarans and skiffs were cruising around the course. Sarah Newberry and John Casey, Nacra 17 sailors and US Sailing Team Sperry Top-Sider members, had an advantage over other competitors after previously training at Oakcliff earlier in June. 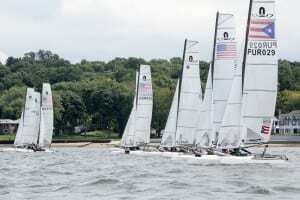 Sailors are looking forward to racing tomorrow after the adrenaline-charged racing today. The first gun tomorrow will start at 12 pm. Thank you to our sponsors Heron Financial Group, T2P.TV, and Gill!